A durable and reliable food plant, buckwheat thrives in a wide variety of climates, soil types and difficult conditions. It produces an abundance of nutritious seeds in a matter of weeks and has kept human beings well fed for thousands of years. Buckwheat has been popular in Russia, Japan, Korea, Italy and France for as long as people have been living there. 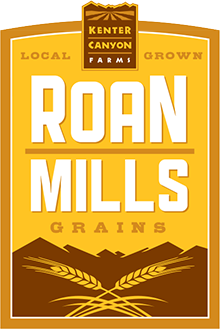 At Roan Mills we mill the entire seed and produce a dark flour with a pronounced buckwheat flavor that is high in protein and contains no gluten. Our basic flatbread is made from the simplest ingredients, just water and flour. If you are unused to the strong flavor of buckwheat substitute ½ of the flour with all purpose flour and ease the buckwheat proportions up as the flavor becomes familiar. In keeping with the general rule of thumb, flatbreads are hydrated at about 50% but buckwheat flour is a little thirsty and will require a little more. Add water, 1 tablespoon at a time, until the dough is supple and holds together. Divide the dough into 12 equal pieces. Round these and cover them with a clean kitchen towel to keep them from drying out while you shape and bake the flatbreads. Preheat a 10” cast iron skillet or griddle on high heat on your stovetop. Sprinkle the work surface with flour and take a dough ball out, press it flat with your hand and begin rolling it into a round, thin, disc with a rolling pin, use flour to keep from sticking, work quickly and without great force. Lift the flatbread by an edge and drape it across your hand to transfer it to the hot griddle. Don’t try to fix any wrinkles or folds as the flatbreads will taste fine even with these imperfections. Practice will refine the technique. Flip the flatbread after 30-60 seconds to cook the other side and transfer the flatbread to a towel-draped plate to keep warm while you make the next one. Serve these dark and flavorful buckwheat flatbreads while still warm, they pair well with savory bean dishes and creamy scrambled eggs and any kind of smoked salmon concoction.